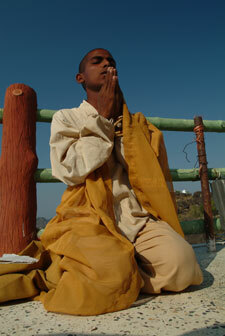 Maharashtra is the sacred seat of Buddhism in India. An estimated 5.8 million—about 80 percent of all Indian Buddhists—live in Maharashtra. Tourists flock to this western Indian state to glimpse inside the more than 1,000 sanctuaries the ancient followers of Buddha carved into the sides of the mountains. Buddhists from throughout India—and the rest of the world—make pilgrimages to Maharashtra paying homage to their religion at temples tucked away in caves throughout the state. In spite of its deep sense of tradition, many report that Buddhism fails to provide the peace its followers are so desperately seeking. Today hundreds of Buddhists are finding that Jesus is the only path to true peace. Amod Joshi was a devoted Buddhist when he met Gospel for Asia missionary Gopan Yuyutsu Khatri. Amod told Gopan all the things he had done trying to attain the nirvana, or perfect peace, promised by Buddhist doctrines. 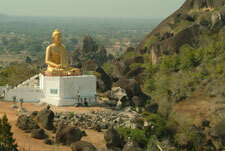 Amod went so far as to fund the construction of a Buddhist temple on a parcel of land he purchased. Yet the peace and harmony his religion promised in exchange for his good works and sacrifices never surfaced. Amod was confused. He had faithfully studied and followed the regimented Buddhist lifestyle. He had performed all the rituals. So where was this peace he had been promised? After listening to Amod’s story, Gopan shared the Gospel with him. For the first time in his life, Amod heard that Jesus died for him and that there was a real, living God willing to give him eternal life. Amod was deeply touched by the message. He confessed his sins and received Jesus as his personal Savior. God also healed Amod from an asthma problem that had tormented him for many years. For the first time in his life, he had real peace, and joy filled his heart. Nanda Punthali Aggarwal was also raised in a Buddhist family. During her childhood, she was afflicted with an illness that caused her to spend much of her life battling intense pain. The pain was not only a source of physical discomfort, but also a means of spiritual reckoning. According to Buddhist teaching, every action, good and bad, influences how the soul will be reborn. Fellow Buddhists assumed Nanda’s pain-filled life was punishment for her actions in a previous life. Buddhism taught her that the only way to escape was by controlling her thoughts and living according to a strict moral code. By this effort, she might be reincarnated at a higher level of existence and find freedom from suffering. The torturous pain became intolerable, and Nanda was desperate. She defied her family’s wishes and covertly went to see her cousin, who is a Gospel for Asia missionary in Maharashtra. Nanda had heard that Jesus has the power to heal people, and she wanted her cousin to pray for her. When she reached his house, she found a group of people praying so she quietly sat down and joined them. As she prayed, miraculously, the pain began to subside. After this introduction to the healing power of Jesus, Nanda was faithful to attend all the prayer meetings and Sunday worship services. She was gradually, completely healed from her lifelong illness. After feeling God’s healing touch, she received Jesus as her personal Savior and felt a strong desire to tell others about Him. With her cousin’s help, she enrolled in a GFA Bible college and is preparing for ministry. Amod and Nanda are now great ambassadors for the Gospel in the Buddhist world. The missionaries who work with them ask you to pray that Amod would grow in his new faith and that his family would also come to know Jesus. They ask that you pray that God would use Nanda as a channel to bring many Buddhist women to saving knowledge of Jesus Christ. She also asks that you would pray for her parents who are still Buddhists.